Summer break is just around the corner and that mean's school will be out and kids will inevitably fall into "brain drain" mode. Doing just a few math problems a day can help kids keep their minds active and not lose all the valuable information they learned during the school year. With the help of the new Casio’s PRIZM fx-CG10 kids will have a whole new way to learn, and have some fun at the same time. PRIZMTM is revolutionary among graphing calculators with features that enhance users’ understanding of mathematics. With conventional graphing calculators, students learn by inputting equations to create graphs. PRIZMTM creates a whole new way to learn math by enabling students to experiment by creating their own graphs over pictures of real-life scenes, and then understand the functions from the graphs that they created on their own. Picture Plot enables users to create their own graphs over pictures displayed on the color LCD. PRIZMTM comes with 55 types of color pictures that users can create graphs over, such as a picture of the parabola of jets from a water fountain and an image sequence of a clock’s pendulum movement. Users can perform regression calculations from the completed graphs to enhance their understanding of math functions. displayed during tracing. The Color Link function links the colors used in graphs to the designated values in the spreadsheet screen, to aid the visual comprehension of trends and changes in values. PRIZMTM automatically color-codes brackets when entering equations with multiple brackets, as a visual aid to facilitate the entry of complex equations. 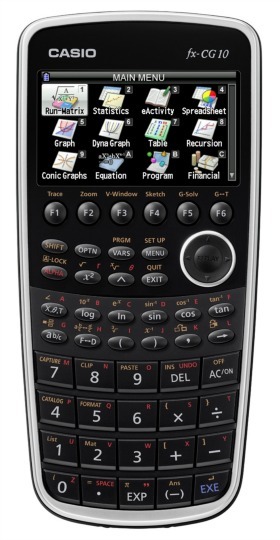 Buy it: You can purchase the Casio PRIZM fx-CG10 Graphing Calculator through the Casio website. Win it: One lucky reader will win a Casio PRIZM fx-CG10 Graphing Calculator ($130ARV). This giveaway will end May 27th at 11:59 PM EST. The winner will have 24 hours to respond to my email. If no response, a new winner will be chosen. Prize fulfillment will be made by the sponsor, I am not responsible for prize delivery or lost or stolen deliveries. Open to residents of the US. I would give this to my daughter...perfect for her math class! My son was just saying he needed one of these for calculus. My nephew. He could use this! My son will be entering 8th grade, plus I have 2 other kids that could use it later on!! I would keep this for my son to help with math and for me for budget. My oldest daughter, who will be a junior in a h.s. could really use this for the upcoming school year in August! My son, for college math. I would love to win it for my daughter in law. She is a school teacher. My niece would make good use of his she started college and likely needs one! If I won this would be for my husband. If I won this I would give it to my boys to share. They have one that the school provides while they are at school, but when they have homework we don't have one to use. Thanks for the opportunity! This would be a great school need fulfilled next year for my daughter. She's going to need this starting next year. My daughter would get this for college! My daughter would use this. She is a college student. This would be for my niece...now taking some harder math classes. This would be great for my 16 yoa son. Thanks. I would have to keep this for myself, I may be going back to college! I would give this calculator to my husband. My teen age daughter would get this calculator for school. I would give this to my nephew for his classes. My oldest granddaughter needs this for school next year. I would use this for studying. I would give to my husband who is a high school math teacher. I would give to one of my grand-kids. I would love this calculator for my husband. My son would love to have it to use.